In 2012, I was training for the memorial half marathon and I made this connection. Having just given birth a couple months before beginning my training, the comparison was fresh on my mind. 1. You can always handle more than you think you can. Just when you think you've endured the worst contraction, you experience another one that makes it look like a little back pain. Or just when you think you've run the longest you could ever run, you add a little more. And then one day, you're running 13.1 miles. Your mind is stronger than you think and your body is stronger than you think. 2. You have to believe you can do it. Yes, believing in yourself isn't just something you tell elementary aged kids who want to be astronauts. You have to really believe you are capable. You don't say, "I'm hoping to do it naturally," or, "I'm hoping to finish this race." No, you plan on it, you commit in your mind, you tell people, you do it. 3. You have to have support. Running without a crowd cheering you on is so much harder than running past smiling faces and people shouting your name during a race. I can't imagine giving birth without having had Colt next to me at all times. This kind of support isn't just to give you a good 'ole pat on the back. It truly is necessary. It's what gets you through. It's also there so you stick to your guns - to help you do what you said you were going to do. 4. You have to set goals. For running, this means signing up, paying for a race, and not backing out. For childbirth, this means confidently telling people you're going to do it naturally, regardless of the facial expressions they may make. 5. The hard, painful journey makes the end so sweet. Think about what it's going to feel like as you cross that finish line. I never thought I'd be fighting back tears as I finished my first half marathon, but I was. And on a similar yet more intense level, seeing your baby for the first time makes every ounce of pain worth it. Running 13.1 miles is something I never imagined myself doing. But back in 2010 when I began training, each week I surprised myself as I ran longer distances. Now, it's my thing. Not in the sense that I'm really good at it, but it's what I do to stay in shape. I've found something that works for me. Giving birth naturally wasn't necessarily something I'd ever planned on, but I was always curious. Who are these women living in our current day and age who are choosing this? Why are they choosing it? If they can do it, why can't I? Sure enough, I learned exactly why people choose it. It taught me so much. The big difference I see in running and birthing (besides the excruciating pain thing) is more related to peoples' reactions. Usually, you don't hear people badgering others for training for half/full marathons. I mean, occasionally. Maybe. But it's not the general public reaction. Thousands and thousands of people train for these things every year. Sometimes several in a year. Most people find it a respectable hobby, give a thumbs up, and continue on their way. But natural childbirth? No. Opinions galore. (Of course, this has a lot to do with where you live.) This one thing can make it a million times harder to follow through with. When you know Bobby, Suzy, and Jan all think it's a dumb idea and don't know why you just won't get the drugs, you may not necessarily feel encouraged. But like I said in #3, find those people who are behind you and cheering you on. For the most part, these two things have a lot in common. They involve hard work, endurance, patience, pain, and perseverance. And when all of that is done, the accomplishment you feel and the reward you receive is pretty dang good. Psst - Don't forget to enter the children's book giveaway and the $50 Amazon giftcard giveaway! Love it! You're so right about all the advice. People normally don't give you too much unsolicited advice about running, but I bet you get it like crazy about childbirth! I never thought to compare running with birthing, but with your analogy it works, and makes total sense and is true. One thing fore sure, at the end of it you have a story to tell, and a unique one at that. Yes, always a story to tell! I've often compared the 2 especially with training for a 50 mile race. Great read! I get this completely! Ever since giving birth to Asa naturally, I have found that I am able to push myself a lot harder when working out. I always think that if I could endure the pain of child birth, feeling like my body was going to rip in half, then I can definitely run a little further. Natural birth definitely has a way of teaching you that your mind and body are so much more capable than you think they are, and I like how you related it to running! I recently started running, and I can relate a lot to one of your earlier running posts about starting with a mile and feeling like that was the greatest accomplishment in the world. I really want to train for the OKC Memorial Half next year. Right now I am just at running three miles at a time, but hey, I have a long time to prepare. Longest comment ever. Sorry! You can totally do it! 3 miles is an awesome start and you will definitely be ready by the time the race rolls around! Way to go! I don't have kids, but I loved this post. I think a huge part of running is learning to just deal with pain and learning that your body can just run through it. But I think runners that are moms have such an advantage at this because they've been through something much more painful than running a race. Thanks! And yeah, that's very true. 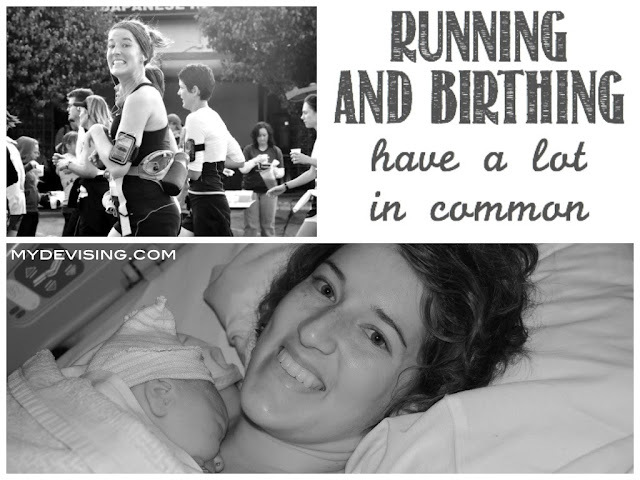 I think a running mindset can help with birthing and vice versa! I love #2. When I worked in a sales position at a job, we were told "hope" and "just" were negative words. I still find that I use hope on a occasion, but I've really tried over the last year or so to work on being more certain with myself. I totally agree that if you can believe in something, it will happen. Great post. Thanks so much for sharing! While I haven’t gone through the act of birthing (and they would be writing a news article about me if I did J ) someone told me a few years ago something that has really stuck… “Running a marathon is like giving birth.. we somehow learn to not remember the pain and just remember the good because otherwise we would never do either one of them again!” Ha! The only one I might disagree with a bit on is #3. I too love the pageantry and social support of big road races, but have also done ultras where I might not see anyone for a couple of hours and you find you have this inner support (that you can take with you and use after the race). Great Post!! 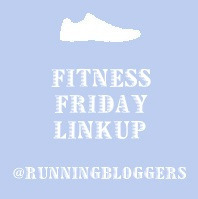 Found you on Friday Linkup! Thanks for reading! Nice to have a guy's perspective!